March of the Return organizers start preparations for upcoming march, which will be a general rehearsal for large-scale march on May 14. The Supreme National Council of the March of the Return has announced the start of preparations for this coming Friday’s march, which will be a general rehearsal for a large-scale march on May 14 along the border with Israel. 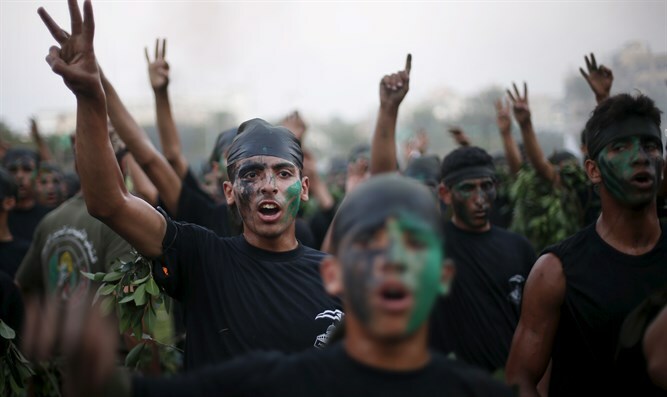 "We are calling on all Palestinians to turn the coming Friday into a date for preparations for the May 14 march with the participation of millions," it said. The May 14 march coincides with the opening of the U.S. Embassy in Jerusalem and is also Nakba Day, meaning the day of the catastrophe, which is marked by Arabs on the date on which the State of Israel was founded in 1948. The statement emphasized that the large-scale march is intended to convey a firm message to U.S. President Donald Trump that his planned “deal of the century” for peace between Israel and the Palestinian Authority would not pass, but that "we (the Palestinians) will trample it by the feet of the millions who return to the homeland." The Council also called on the Arab and Islamic peoples and on liberals around the world to mobilize their forces to assist the Palestinian people in implementing their goals, primarily the liberation of the land and holy places and the end of the siege. Since March 30, Gazans have been holding weekly marches towards the border with Israel, clashing with IDF soldiers and throwing rocks, firebombs and kites with flaming objects attached. On Friday, the rioters set fire to the Kerem Shalom crossing between Israel and Gaza, causing damage to gas pipelines that run from Israel to Gaza and are intended for use by Gazan residents. According to Palestinian Arab figures, 45 Arabs have been killed since the violent riots began.